I might have mentioned previously how lucky I am to be in an area that actually has a food truck that is dedicated gluten-free and serving the gluten-free (and non-gluten-free) community amazing food. 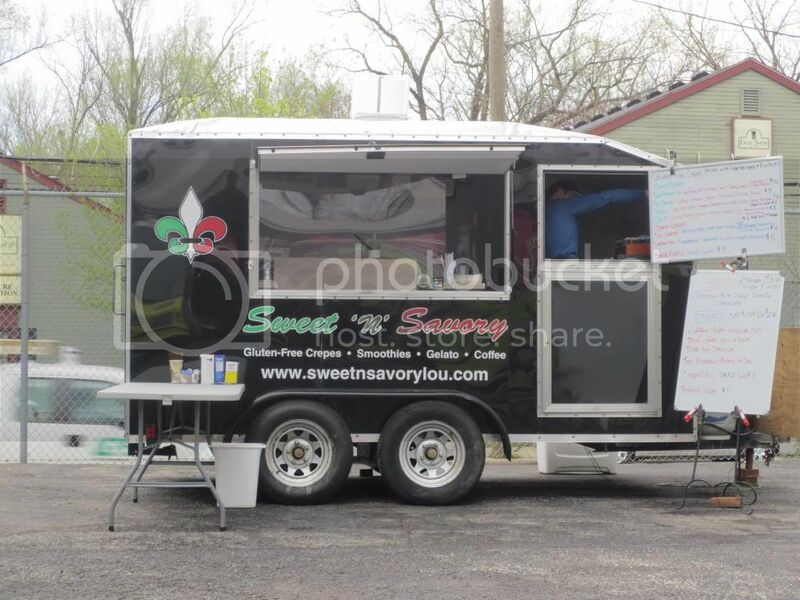 Sweet ‘N’ Savory is the food truck I speak of, based out of Louisville, Kentucky and run by the most amazing people, Richard and Ashley Giannini, who chose to open a food truck specializing first and foremost in gluten-free crepes, with the additional inclusion of smoothies, gelato, and coffee. They are the first and only place to offer gluten-free crepes to the Louisville area. And, let me tell you, this truck is worth hunting down for those crepes. Both sweet and savory versions are to die for and made to perfection. I was hooked on one bite the first time I was ever able to check them out. You see, Louisville is growing in the foodie world and food trucks are starting to emerge in this city. Nothing could make me happier! Honestly. Especially since I can actually eat at one! Food trucks are amazing things, and thankfully Louisville has places and events where these food trucks gather and people come and choose between the offered menus…making an easy and fun way to dine out every now and again. This past weekend, Apocalypse Brew Works hosted yet another food truck gathering…this time called Cluster Trucked. What is Cluster Trucked? Well, for one night only, the usual menus offered by Louisville’s finest food trucks got turned upside down. What these trucks would normally offered weren’t anywhere on the menu. In fact, they were serving up something unique and different…and it just made for a fun and interesting event. As stated before…my focus was on Sweet ‘N’ Savory…although I could have easily eaten at French Indo Canada as well. Nice to have the option…but I am loyal to my favorite food truck and it had been forever since I was able to actually eat a hand-made ravioli. Yes…the prepared all their ravioli options from scratch. Impressive, yes? 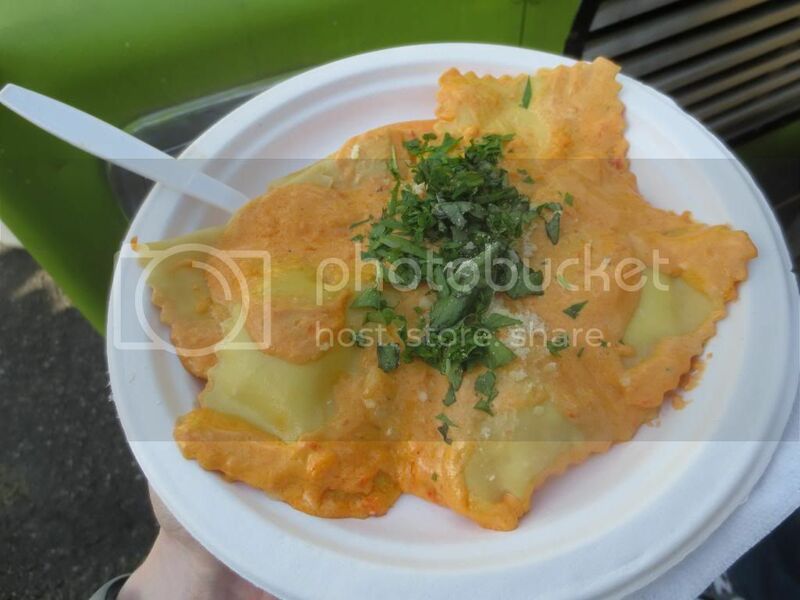 When I placed my order, I got the Three Cheese Ravioli with the Roasted Red Pepper Cream Sauce (it was the vegetarian option) instead of the Homemade Marinara ($10.00). I spoke with Richard and Ashley for awhile…anticipating my first real (as in not bought out of the freezer section) ravioli since…I had to go gluten-free, honestly. I was practically salivating. The line was getting longer, so I let them get back to work. I loved seeing their truck flooded with orders. And everything was made to order, which means nothing was done ahead of time, save the actual making of the ravioli. These raviolis were dropped into boiling water to cook until they were soft and ready. They were then finished off in a pan with the sauce. It took a little while, but I was happy to wait. Quality food is always worth the wait. I was watching other orders come up ahead of mine and getting really giddy about the moment they would call my name. It happened and I hurried over to claim my gluten-free ravioli and duck out of the warm sun into a shady spot to enjoy. My roomie was already devouring her meal. She opted to go with the chicken wings that Holy Mole offered…and went Korean as an added twist…and was already devouring them. She had sauce all over herself. Which meant she was eating them right. So, with my tummy rumbling and this amazing looking pasta feast in front of me, I was ready to dive in to the eight…yes EIGHT gluten-free ravioli that Sweet ‘N’ Savory prepared. One bite…and I was almost in tears. The ravioli was, perhaps, one of the most perfect foods I have ever had the option of eating since going gluten-free. The pasta was cooked to perfection. So light, soft, and that perfect al dente that you want. The cheesy filling was melt-in-your-mouth savory goodness. Literally, the ravioli just melted against my tongue. It was the most perfect thing I have eaten in a long time. And holy ravioli, that red pepper cream sauce…I want that recipe because it was the perfect topping for this ravioli. Honest to goodness great food. I gave a ravioli to my roommate to try and she said, “I like your food better!” HAHA!! Victory. We both finished off our meals of choice, me taking my time to just let the various flavors sing across my tongue and taste buds. It was still gone way too fast. 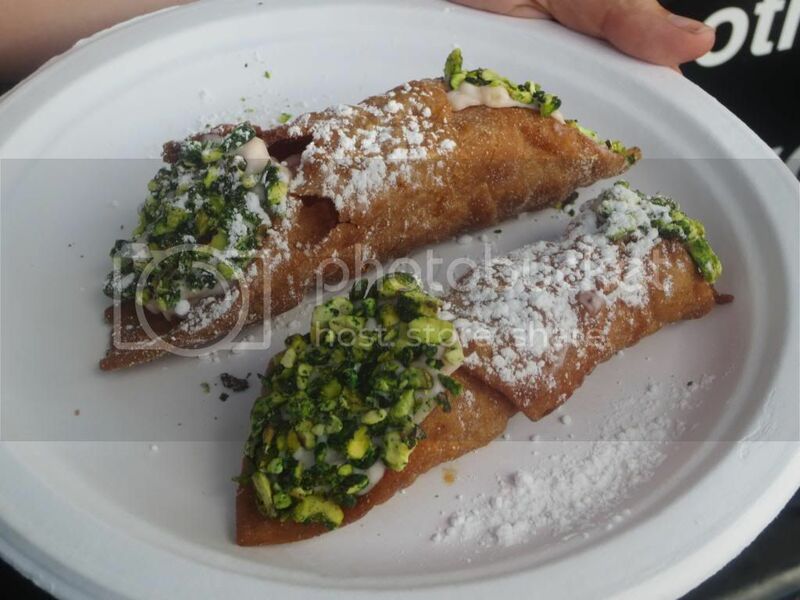 But…there was also mention of gluten-free cannoli ($4.00). Now, I like cannoli and haven’t been able to have it in years. My roommate, however, calls cannoli one of her most favorite desserts to eat…ever. In fact, if we go to an Italian restaurant or any place that offers cannoli…you better believe she’s getting it for dessert. We skittered back over to Sweet ‘N’ Savory and placed an order for two of the cannoli. Ashley got to work on that one as Richard continued to push our the growing number of ravioli orders. Like I said…I love seeing my favorite food truck so busy. This is only a good thing. A short wait later and Ashley was handing over a plate of two fried rolls filled with cream and pistachio, dusted with powdered sugar. They looked…awesome!! We got out of the way and each took our dessert in hand. This was no ordinary cannoli. The cream on the inside had a fruity flavor…I think it was strawberry. And they had chocolate bits scattered within it as well. Nice touch. It was definitely unexpected. The pistachios on the outside gave a bit more texture and flavor. And then…that sweet confectioners sugar…it was the icing on the cake, as it were. Every bite was just…fantastic. Crunchy, sweet, and bursting with fresh flavors. It was my ideal dessert that night. Nothing could have been better. Not even ice cream. I loved that this event happened. It was so much fun to come out to a Louisville Street Food Alliance event and see the regular food trucks serving up something out of their comfort zone and norm. It was an absolute blast. And I loved going around and seeing what each truck did to their menu. It was definitely a great time. Thank you, Sweet ‘N’ Savory…for once again providing this vegetarian and gluten-free foodie a food truck option of amazing, homemade, hand-prepared goodness. Nothing compares to the care, dedication, and love that you put into your business. Your products reflect it. I can’t wait to see you next time! This entry was posted in Cheese, Dessert, Entree, Food, Gluten-Free, Italian, Local, Pasta, Restaurants, Review, Sauce, Sweet Stuff, Vegetarian by The Celiathlete. Bookmark the permalink.